The Stuff That Matters, textiles collected by Seth Siegelaub for the CSROT, at Raven Row in London's Spitalfields, is an exceptionally beautiful show. Combining antique textiles from all over the world with exquisitely minimal curation, it offers a feast for the textile enthusiast. Raven Row is a stunning contemporary exhibition centre, all white walls and stripped floorboards, and usually home to exhibitions showcasing the bleeding edge of contemporary art. The elegant 17th-century houses it occupies were originally home to Huguenot silk-merchants, an aspect of the building’s history on which this latest exhibition riffs. The curators of The Stuff That Matters have self-consciously departed from the norms of textile display to create a beautiful and unconventional show that revels in the decorative elements of the textiles, all of which come from the collection of Seth Siegelaub. Alongside them are stunning examples of Siegelaub’s parallel collection of books on textiles, forming indispensible visual and textual crutches for the visitor. In some ways it almost feels as if the show is more about Siegelaub than about his textiles, and certainly, as a collector he makes a fantastically interesting specimen. Siegelaub is arguably more famous for his position at the forefront of the conceptual art scene in New York in the 1960s and 1970s than for his textile collection, and the curious combination of conceptual art and antique textiles lurks a little uncomfortably in the background of the pristine spaces. On a purely decorative level, the show is stunning: from small Coptic fragments to heavy velvets from early modern Europe and African and Asian headdresses. For those with their eyes on things Turkish, the Venetian and Italian textiles show strong and pleasing Ottoman influences; here and there Islamic textiles can be found. But there are many question marks surrounding the provenances and dates on the simple white cards that lie next to each fragment. Even with question marks, many of the datings and provenances are guaranteed to raise an eyebrow or two amongst the more expert visitors. The lack of a strong and committed art-historical approach is certainly distracting – noticing a pristine pre-Colombian headdress I was astonished to read that it was supposedly 2000 years old – but it is the playfulness of this exhibition that makes it so charming. Siegelaub has an enduring interest in the commerce of textile, in its role as a commodity, its social meanings, as well as its decorative functions. 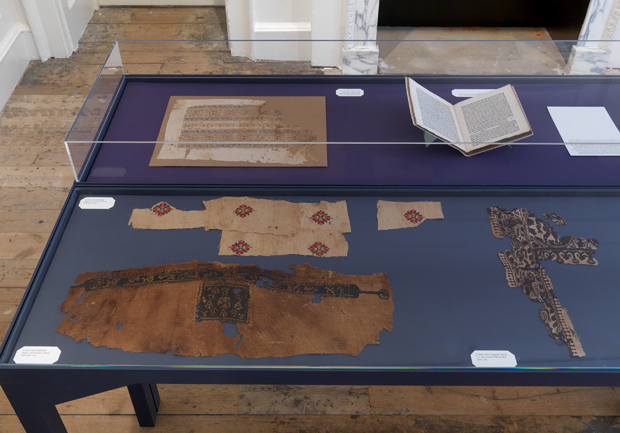 And the books that pepper the display cases pose questions for the visitor about how to approach the fragments of fabric: as archaeological artefact, objet d’art or just a scrap of vestment. Weaving together text and textiles, this is a show that plays to its decorative strengths, eschewing the strictures of an overly historical approach in favour of a social, cultural perspective that revels in the multiple meanings fabrics carry for the wearer, viewer and collector.